I lost my necklace the other day. It wasn’t valuable, under $20, as I recall. Still, every time I wore it, I received compliments. Understated, the colors muted enough, and varied enough, it went with everything I own. Beads strung with a fishing line, monofilament, I guess you call it. 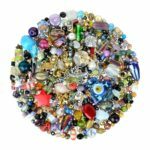 Each round bead had a cage around it of straight cylinder beads, and between those were beads in a variety of other colors and shapes. It felt good around my neck, reaching almost to my waist. The necklace was unique, and I felt pretty, special, finished when I wore it. As any woman knows, those are items one treasures. When I bought it, there was not another one in the store. A departure from the usual jewelry I wore, I loved the uniqueness of it. Weeks later, I returned to that store, and saw “my” necklace on display everywhere in the store. So much for unique, but I still love it. I realized it wasn’t on my neck after I got home from play rehearsal. How could I lose something so noticeable? Frantically, I called the rehearsal hall, no one had seen it. I guess I can go back and see if the store still carries it. That’s not the same, though, is it? I mourned its loss, and wondered how I could lose it. Then I thought about the absent-mindedness I’d noticed lately. I was forgetting things. Words escaped me, peoples’ names, places. Familiar things I should know. Was this something more? We had the weekend off from rehearsals, and on Monday, I tried one last chance. “Anyone turn in a necklace?” I started to go on to describe it, but the young man at the desk interrupted me. “Well, it is broken somewhat, but I picked up all the pieces I could find. Wait right there! I will get it.” And he took off on a run. I followed him, or tried to. He was on a mission, and didn’t wait for me. When we connected, he had a necklace cradled in his hands. My necklace. off before I could ask any questions, or even properly thank him. Here I sit at my desk, with the necklace laid out on a paper towel, just like it was made. The circle is still there, with one of the two fine lines broken. Missing some beads. Those he managed to recover I carefully arranged next to the necklace. I look at it, think what can I do with it, and straighten a piece here and there. Mulling it over. Is it just a necklace, easily replaced? Maybe find a jewelry designer who knows how to work with beads? Buy another? It wouldn’t be the same, though, would it? It sits there, almost whole. Is it a testament to my carelessness? The pride and self-centeredness I exhibited when I put it on? Or is it just a necklace? A thing easily enough replaced. Oh, but I will miss it.